My trip to the old York County area of Ontario this past summer impressed on me the truth that it took all classes of society to develop our country in its early years, whether they made it into the history books or not. Of course, it's exciting to find the story of an ancestor mentioned in a book like I showed in my last post, Plug Hat - Bowler or Top Hat?, but finding an ancestor who wrote their memoirs is special. Note that we're talking ancestors in a very broad sense here because the subject of this post is Susan Sibbald who is the great-great-grandmother of the wife of my husband's first cousin 1x removed. 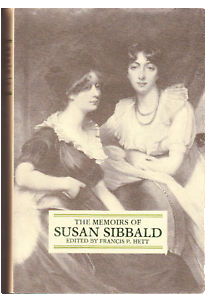 The Memoirs of Susan Sibbald, 1783-1812 is the memories of Susan Mein Sibbald's life as the fifth daughter of Thomas Mein, a physician in the Royal Navy, whose childhood was divided between life on the Cornish coast of the Channel Isands, and summers at her father’s estate, Eildon Hall, near Melrose in Scotland. In 1807 after receiving her education at Belvedere House, a very fashionable Bath boarding school, she married Lt Col William Sibbald. Between her father and her husband, her memoirs reflect a woman's view of the social life and customs of upper class military circles. Susan and her husband had two daughters and nine sons, two of whom had been sent to Upper Canada in the early 1830's to learn farming techniques. In 1835 with his health ailing, William stayed behind while 53 year old Susan and son Archibald, sailed to Canada to check on their sons, William and Charles, who apparently were living above a tavern on the western shore of Lake Simcoe. While touring the lake, Susan fell in love with the beauty of William Kingdom Rains' land near Jackson's Point. Rains wanted to sell and start a community on a nearby island, so they struck a deal whereby Susan bought 600 acres which included several cottages. Susan moved into the largest cottage, renamed it Eildon Hall after the Scottish estate she'd spent her summers at as a child, and gave her sons the task of turning the raw wilderness into a comfortable British estate. 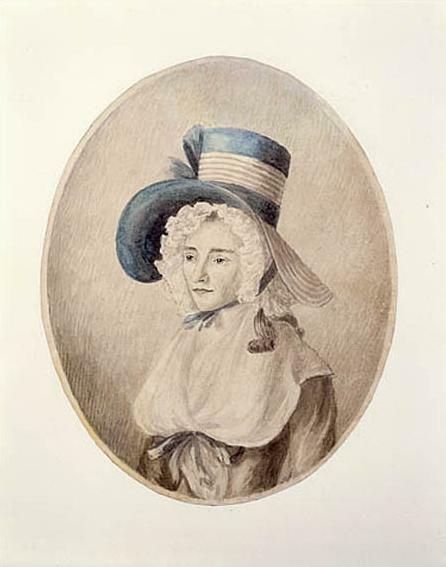 According to the Dictionary of Canadian Biography, Susan returned to Scotland in March 1836 to the realization that her husband had passed away in her absence. She only stayed long enough to settle her affairs before returning with her three youngest sons to the new Eildon Hall in Upper Canada. As a forward thinker and woman of action, one of Susan's first actions in her new land was to join with other area land owners and petition the government for a school, church and burial ground. The school became a reality in 1837. 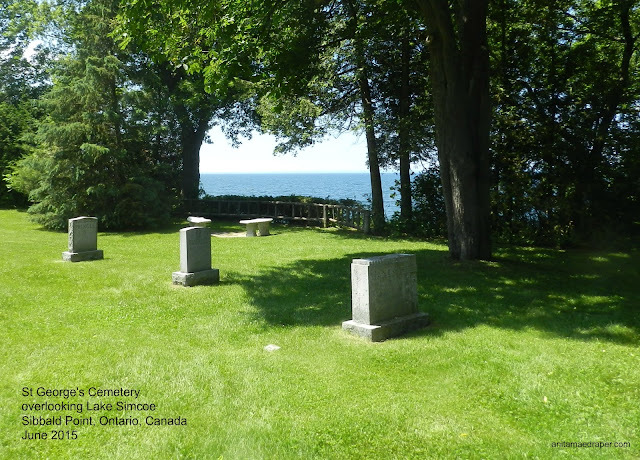 According to the Town of Georgina website, Susan donated 66 acres along the Lake Simcoe shore for a church and cemetery. Others donated money, materials, and five more acres. In 1938, they began work on a wooden log church, holding services in Eildon Hall while the work progressed. Susan suggested the church be named St. George because she admired him as a warrior. The name stuck. Aug 1839 saw the dedication of the first St George's church, a fine log building with stained glass windows. Although no images of the church remain, at least one of the stained glass windows has survived as a personal memoir in itself. For its creation, Susan turned to an old school friend, Elizabeth Gwillim Simcoe, whose husband, John Graves Simcoe, had been the first Lieutenant Governor of Upper Canada. Elizabeth had taken the opportunity of touring with her husband to sketch and paint a series of scenes depicting everything from the beginnings of York (now Toronto) to the daily life of living in the wilderness. When Susan Sibbald asked Elizabeth Simcoe to design a window, Elizabeth sent the request to her daughters back in England who were also accomplished artists. The daughters designed and hand-painted a window, then bundled up the panes and shipped them to Susan in Upper Canada. 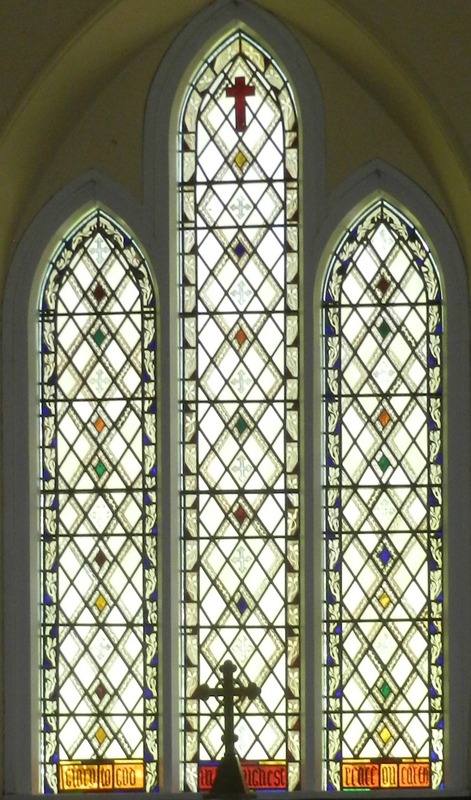 According to the church website, in 1845 the window was installed in St Georges Church. After Susan's death in 1866, her sons wanted to honor her life by building a church that would withstand centuries. Using logs, they moved the original church closer to the Lake Simcoe shore to continue the services while they worked on the new stone one. 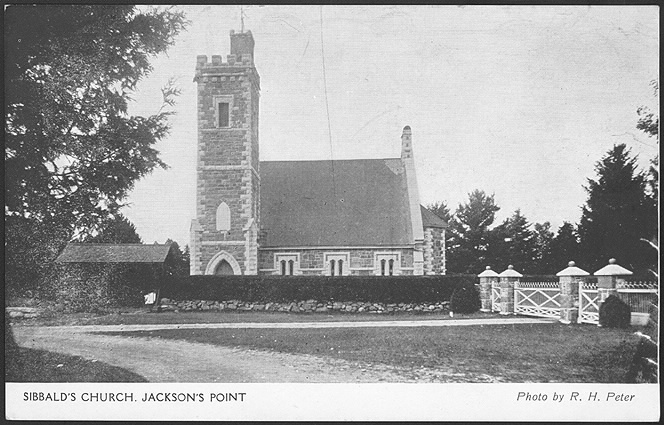 The stones were shipped on a scow from a quarry near Barrie to Jackson's Point which was the nearest wharf. From there, the stones were transported by wagon along the lakeshore road to the building site. 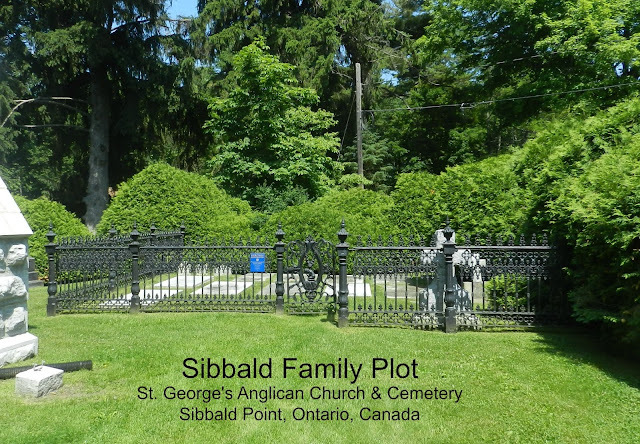 Speaking of Susan's son, Capt Thomas Sibbald, R.N., the Town of Georgina website states that each day "at precisely eight bells", the Captain "issued rum rations to toast the Queen's health, then work began. Thomas carefully monitored the stone cutting and laying, to ensure no iron deposits or imperfections escaped his eye; one did and can be seen on the west wall "displaying a rusty stain". Upon completion, the Simcoe stained glass window was removed from the old church and set above the communion table of the stone church, which is where I photographed it this past June. The church was opened in 1877, but it was years before the interior was complete. Local butternut was used for the pulpit and prayer desk, while the communion table and hymn board were crafted from oak. 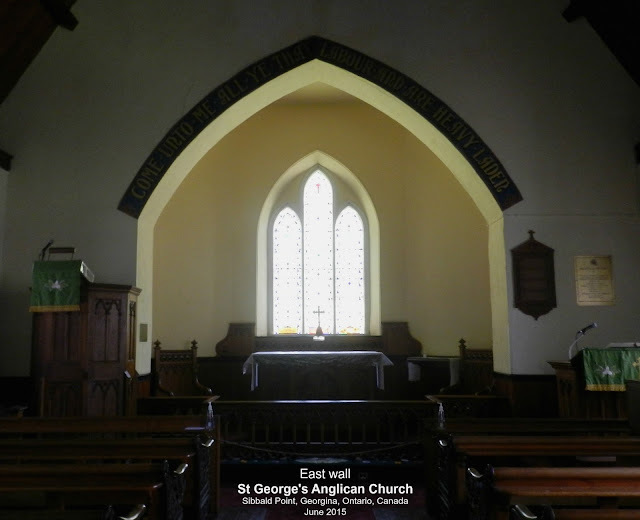 St. George's Church brochure, which reflects the church website, mentions the cast-iron artwork at the end of the pews as "an art form of the period in which the church was built." 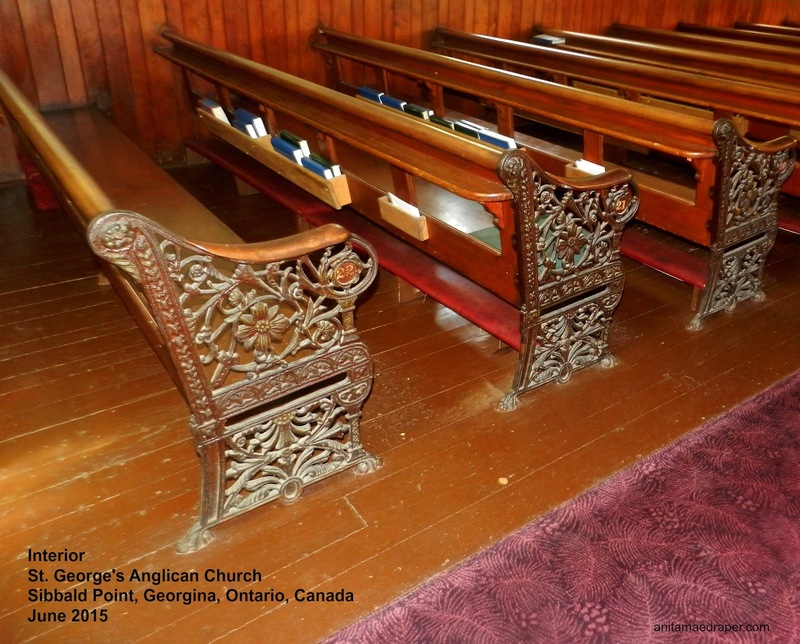 Cast-iron pew ends at St. George's Anglican Church, Georgina. If you've wondered about the shortened tower, it was a result of repair due to deterioration of the top part. Susan Sibbald and her family are buried in the southeast corner of the church yard, close to the lane that leads to Eildon Hall, among the cedar hedges that Thomas Sibbald loved so well and planted around the perimeters. 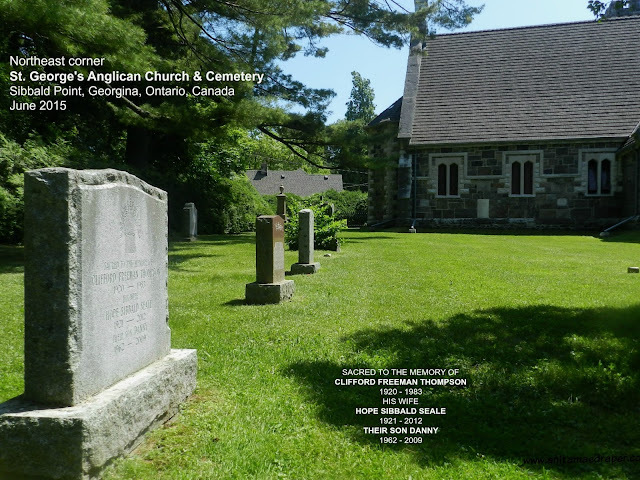 Across from the Sibbald Family Plot and in full view of the old stone church is the area reserved for Sibbald descendants and special family friends. And this is the part of the cemetery where I found the memorial of my husband's cousin, Clifford Thompson, his wife, Hope Sibbald Seale, and their son, Danny. 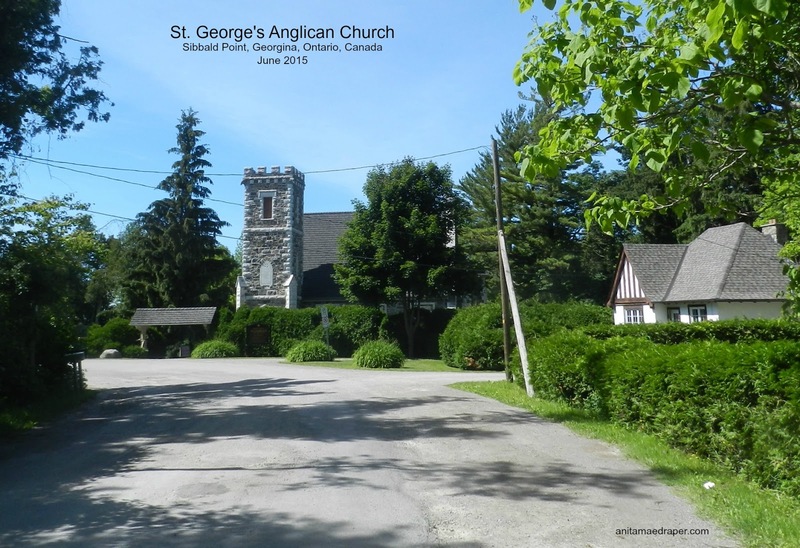 When I look around the grounds of St. George's church and cemetery, I can understand how Susan Sibbald felt when she first saw this land along the southern shore of Lake Simcoe. 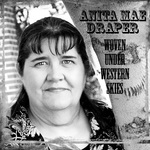 With her vision and fortitude, it has emerged as a peaceful, beautiful place that has withstood the years with grace. Today St. George's and its picturesque grounds continue to serve as a spiritual, historical and cultural centre for the community. Visitors are welcome to all services. Visitors are also invited to sit in silence, to pray and to use the prayer desk book to request prayers. Susan Sibbald's descendants protected her vision until 1951 when they sold part of the estate to the County of York to be opened as a park. In 1956, the County handed it over to the Province and the next year, Sibbald Point Provincial Park opened to the public. With its long sandy beaches, shaded campsites, grassy picnic areas, playground, and a forested hiking trail, along with numerous modern upgrades to its facilities, this legacy of Susan Sibbald has been a treasure for thousands of families to enjoy. Situated in the Park near the Point, Eildon Hall retains the furnishings as they were in Susan's time and is open to the public as the Sibbald Memorial Museum. 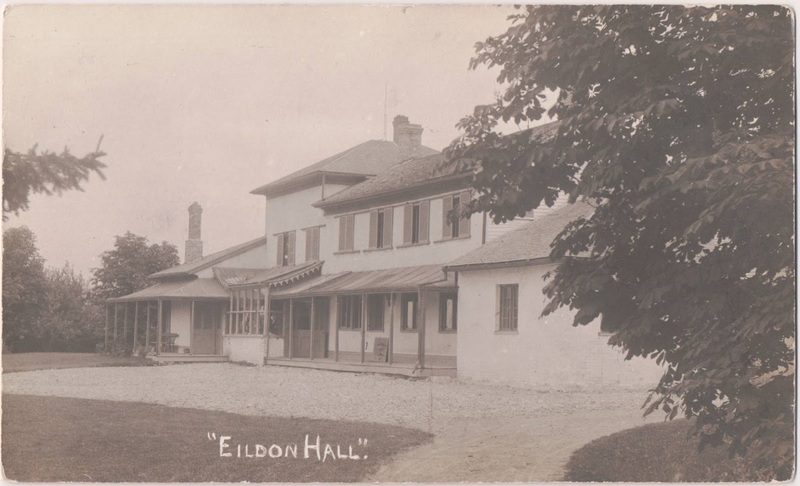 An Ontario Historical plaque commemorates Eildon Hall as an important part of Ontario's heritage. I hope you enjoyed this look back at a strong woman who helped shape Upper Canada. Is there someone you know who deserves similar recognition? Yes, Sharon, Cliff Thompson and his family. If you've followed my Author Memories posts, you may have seen that he's connected through the Nelson side of the family.